When Did White Men Become The Bad Guys in America? When I was a kid, I lived in a small town and I didn’t know any Jewish people. Of course, because I didn’t know any Jewish people, my Jewdar was so bad that Mr. Goldberg could have invited me over to enjoy some matzo ball soup and I would have still had no idea he was Jewish (No, really, I’m not kidding). Because I had no experience with Jewish people as a kid, I was particularly perplexed by anti-Semitism. Obviously, a lot of people in the world hate Jews and very occasionally, I’d hear an anti-Semitic comment. The reason I did not understand this was every stereotype I’d heard about Jews was positive. It was like, “Those Jews! They’re so frugal! They’re always working hard and reaching the top of their fields in banking and entertainment! In fact, they’re so crafty and Machiavellian, they’re practically super human!” Granted, some of the compliments were delivered in a backhanded manner, but to me, Jews sounded great. Bizarrely, now that I have gotten older and have had a chance to meet quite a few Jews, I often find them to be wonderful and competent people, but if anything they don’t live up to the nearly superhuman stereotypes of the people who hate them. Back then, it was outside my reality to imagine that a group of people could be hated for being successful. Yet, what I’ve learned since then is that people or groups that tend to do better than the people around them are often hated for it. We’ve all seen this with celebrities who are richly despised by many people for no good reason other than that they’re famous. It happens this way with groups as well. As the great Thomas Sowell has noted, “middleman” groups that have done better than the native population by being successful in professions like retailing and banking are often despised and persecuted. Not just the Jews, but the Chinese in Vietnam, the Armenians in the Ottoman Empire, the Lebanese in Sierra Leone, the Japanese in Peru and the Indians in Burma among other groups have been mistreated and even massacred for the crime of being successful. Here in America, there are no massacres happening and white men are certainly not a minority, but white men are regularly passionately smeared, attacked and degraded in our country. White people (men included) are the only group in the country that is discriminated against via Affirmative Action by official government policy. In all fairness, Asians are also discriminated against by universities that often wave them off in favor of less qualified applicants from different racial groups, but there’s no widespread cultural assault against Asian Americans. 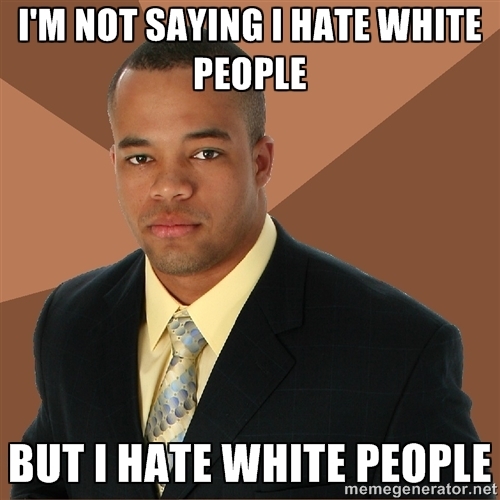 To the contrary, when it comes to white men, outright hatred based on our skin color is commonplace. Just look at some of the stories we’ve covered at Right Wing News over the last couple of months. It’s not like we’re looking for these stories or covering every one that comes down the pike; there are just so many hateful attacks aimed at whites in general and white men in particular that they’re bleeding into the news. When you’ve spent your whole life believing that everyone should be judged by the content of his character and the merit of his actions, not the color of his skin, it’s a little shocking to find out that almost no one seems to believe in this idea any more except for mostly white conservative Americans. Ironically, some of the most virulent hatred towards white men comes from white female feminists. Most people don’t ever stop to think about what a bizarre situation this happens to be. Imagine you have a white woman with a white father and a white brother, going to a college founded by a white man, using an Internet created by a white man to rail against white men and call them potential rapists because she’s not a happy person. Rather than just dealing with it or making some changes, the liberal feminist decides white men are responsible for her coming up short of her dreams. If you want to feel sorry for someone, feel sorry for the male children of a woman like that. Granted, white men are far from perfect. White men were responsible for slavery…and ending slavery. For denying women the right to vote….and giving women the right to vote. For the best and worst actions of U.S. soldiers, for the best and worst actions of U.S. Presidents, for the best and worst actions of heads of industry. Why are only the negatives supposed to be relevant? We live in the strongest, most powerful, most prosperous nation in human history and if we’re being honest, white men probably deserve 95% of the credit for that. That may be unfair because women and black Americans weren’t given the opportunity to significantly contribute for most of our nation’s history, but it is true. That being said, you don’t hear white males saying, “You can’t talk about the Constitution and the Bill of Rights. That’s appropriating our white heritage!” All most white men want to do is just live their lives to their fullest potential, just like everybody else without being smeared as the devil because of our skin color and our gender. The standard response to this is something like, “Oh yeah, like all these attacks and discrimination are really hurting white men! Pish! Look how well they’re doing!” Of course, many white men AREN’T doing that well. For every Bill Gates or Warren Buffet, there are a hundred thousand guys eking out a living while they’re continually chastised for the color of their skin as opposed to anything they’ve actually done wrong. Yet and still, some people say that because white men have been successful in American society overall, it must be biased in their favor. However, if one racial group isn’t performing as well as another, why assume racism instead of encouraging people to mimic what works? That seems much more likely to produce a good outcome than spewing racial hatred and falsely claiming to be a victim. Unfortunately, there’s a lot more money to be made convincing people that they aren’t responsible for their own failures while you point the finger at a convenient bad guy.